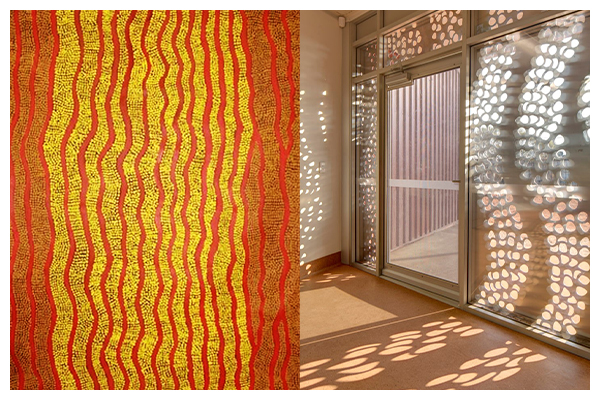 The artwork of four Martumili Arts Centre artists have been licensed and replicated in beautiful metal screens for two remote community medical centres in the Western Desert. The Punmu and Parnngurr Aboriginal Health Clinics in the Western Australian Desert, 1800km from Perth and at least 400km away from their nearest towns, are some of the remotest communities in Australia. They make up two of the four remote communities of the Martu people who have lived on their country for millennia before being some of the last Aboriginal people to have contact with Europeans. The Punkurunu Aboriginal Medical Service (PAMS), a community organisation with a Martu Aboriginal board is the sole provider of primary healthcare services for the four Martu communities. PAMS required two new clinics whose design approach would embrace the respect of people, land and culture to create a facility with community ownership. Artist Jakayu Biljabu’s is pictured in front of the window screen at the Punmu Clinic adapted from her artwork ‘Pitu, Kulilu’ (left). Photos courtesy of the East Pilbara Arts Centre and Kaunitz Yeung Architects/Brett Boardman. Designed by Kaunitz Yeung Architects, the company’s process was underpinned by consultation which engaged the communities, the clinicians and the medical service in an ongoing dialogue through the design and delivery of the buildings. Most importantly the respectful and engaging consultation developed an architectural outcome that engendered community ownership and culture whilst meeting the clinical and technical requirements of the project. The architects say the art screens in particular have imbued a sense of pride in the community, enabling the buildings to pay respect to elders, artists and culture, and to enrich the community. The community selected a list of artists and artworks which were shortlisted based on their ability to be integrated as art screens. The community then chose the final two artists for each building and their artworks were translated into three art screens per building. At the Punmu Clinic, the art of Minyawe Miller (Untitled) and Jakayu Biljabu (Pitu, Kulilu) was licensed from the Copyright Agency for the screens. While at Parnngurr Clinic, the art of Wokka Taylor (Tali North of Punmu) and Sonia Williams (All the honey ants) was licensed. 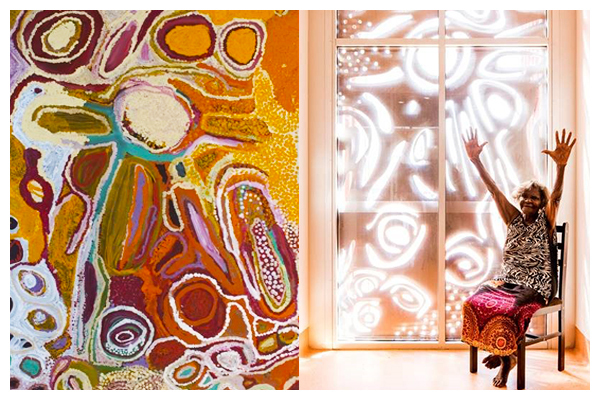 Wokka Taylor’s artwork ‘Tali North of Punmu’ (left) was adapted onto windows at the Parnngurr Clinic. Photos courtesy of the East Pilbara Arts Centre and Kaunitz Yeung Architects/Brett Boardman. Minyawe Miller’s artwork ‘Untitled’ (left) was adapted onto windows at the Punmu Clinic. Photos courtesy of the East Pilbara Arts Centre and Kaunitz Yeung Architects/Brett Boardman. Photo courtesy Kaunitz Yeung Architects/Brett Boardman. Sonia Williams’ artwork ‘All the honey ants’, was adapted into a window screen at the Parnngurr Clinic. Photo courtesy the East Pilbara Arts Centre. 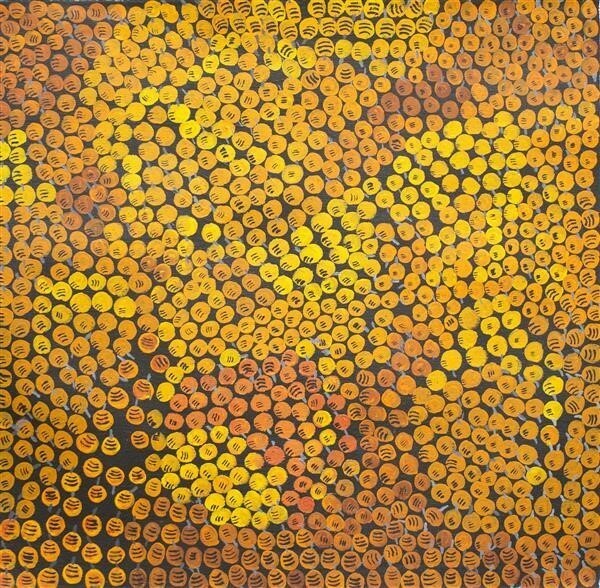 Image Credit: Sonia Williams' artwork 'All the honey ants' (detail), was adapted into a window screen at the Parnngurr Clinic. 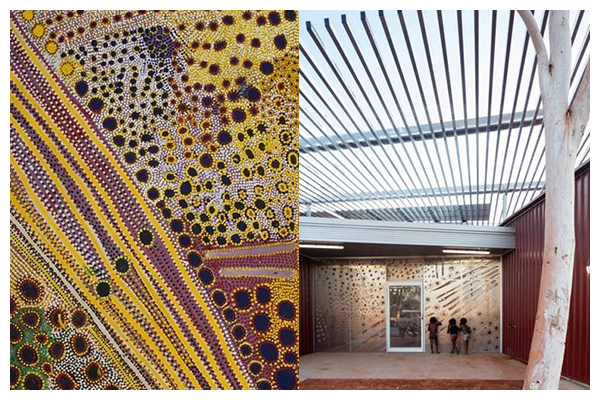 Photos courtesy the East Pilbara Arts Centre and Kaunitz Yeung Architects.